I knew, when I moved back to California from New York, that I’d be losing fall. Fall in the Northeast was my favorite season — the crisp air, the brilliant colors, the smell of rain. I was always eager to don my sweaters and pull out the soup pot. We do get a semblance of that fall in Southern California — it just arrives in November or December and lasts until February. September this year has been especially trying. I know intellectually that September is the hottest month of the year. But the seemingly endless string of days over 90 degrees are making me yearn for autumn relief more than usual. I am tired of grilled chicken and gazpacho. I want sweaters! Brussels sprouts! Bean soups! But really, the idea of eating bean soups when it’s 103 in the shade is … off-putting. This french toast, then, is my brave attempt to bring a little autumn to my life. The Nuni loves french toast, and while pancakes seem daunting even for a weekend breakfast, I’m always up for a quick egg soak and a fast saute. The five cans of pumpkin puree in my cupboard (we can call it what it is — aspirational pumpkin) inspired me to spice up my usual quick and easy French toast with a little fall flair. I thought that pumpkin pie filling is really just pumpkin added to eggs, cream, sugar and spices — change the proportions slightly and you have the perfect soak for french toast. After all, I may not feel like turning on the oven, but I can handle 10 minutes on the stove. The scent of pumpkin and ginger and cinnamon gives me hope that a little bit of fall is just around the corner. I may even pull a sweater out tomorrow. A linen sweater. Baby steps. In a wide and shallow bowl, beat the eggs lightly with a fork. Add the pumpkin, cream, maple syrup, spices and salt, and stir to combine. Soak the slices of bread in the egg mixture, flipping to ensure that both sides absorb the eggs. Melt some butter on a griddle or nonstick skillet, and saute each slice of soaked bread in the melted butter, flipping when the first side is brown - 1-2 minutes per side. 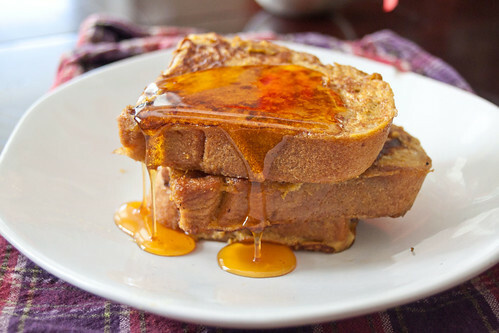 Serve warm with additional maple syrup or golden syrup or your french toast topping of choice. I think I’m going to see if I can try this with my nephew next weekend. Great pictures – love the syrup in motion. This makes me wish my husband wasn’t allergic to eggs and dairy products. 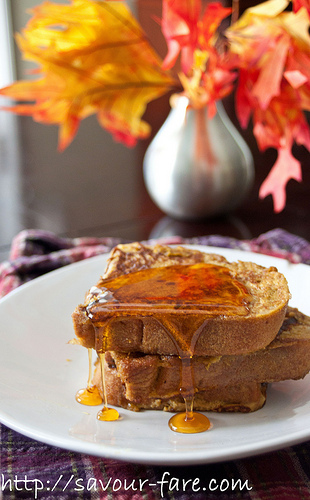 I miss French toast and LOVE the idea of pumpkin style! I live vicariously through your messages. Thanks Kate. I keep thinking of French toast. Have not had in years. Over the weekend, I thought I start keeping some bread around for those lazy Sunday mornings. Now, I am inspired even more. And I have a couple cans of emergency pumpkin in the cupboard!! I suddenly have a craving for french toast! And pumpkin pie french toast?? Yes please! Just made for our hurricane breakfast. Delicious and what a nice change from the traditional French toast I always make. Thank you!